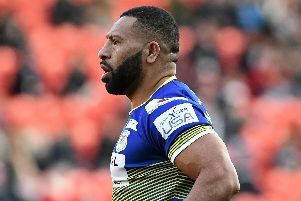 Doncaster RLFC kept in touch with the teams at the top of Betfred League One following their 70-18 win over bottom club West Wales Raiders at Stebonheath Park. The third-placed Dons led 42-0 at the break giving rise to the possibility of them becoming the third team in succession to top the 100-point mark against the struggling Raiders. However, the home side dug their heels in and Doncaster’s intensity dropped. “It was one of those games where we probably couldn’t please everybody no matter how we did,” said Dons No 2 Pete Green. “For us it was a case of putting a decent performance together and being disciplined in what we did. “Had we been as clinical as we were in the first half then we possibly might have gone close (to scoring 100 points) but we dropped off for a 15-minute spell in the second half which can happen when the game is won on a hot day following a long journey. “Full credit to West Wales. “They never stopped trying and tried to play a bit of rugby and once they scored the first of their three tries it served to energise them. “It might sound strange after we scored 70 points but the lads were a little bit down when they came in after the game due to how they played in the second half whereas they had felt good at half time. “But the main thing is that we came away with the two points and didn’t pick up any injuries. “We also took the opportunity to give a couple of players, who put their hands up to play, an extra week to get over knocks they had been carrying.